The 26th Annual St. Kitts Open Golf Championship is set to take place from May 25th to 27th at the Royal St. Kitts Golf Course. 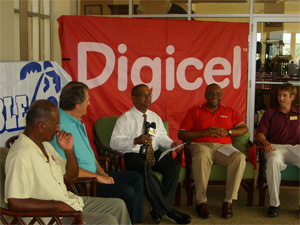 Digicel and The Cable were named sponsors, The Cable for the eleventh time and Digicel for the second. On Wednesday, Vice President of the St. Kitts Golf Club Vernon Viera accepted cheques from Bill Ewing, managing director of The Cable and Donovan White, Country Manager of Digicel St. Kitts-Nevis which totalled EC $25,000. Viera was also joined by the President of OECS Golf, Lee Bailey, the chief executive of the Golf Club as he thanked both companies for their continued sponsorship of the event. “I commend The Cable for its eleventh year of sponsorship and Digicel for coming on board a second year to sponsor this tournament But beyond the sponsorship of the event, we are very pleased that both companies have agreed to get more involved with junior golf. I know that there is always this perception that golf is a rich man’s sport but I think we are dispelling that notion as we are getting a lot of people involved from different social backdrops,” Viera said. Bailey took the opportunity to comment on the importance of the tournament in the overall success of OECS golf. He explained that in order for regional golfers to qualify for selection to represent the OECS, they first had to participate in the St. Lucia Open Championship. It was also noted that the event was held a few ago and won by Kittitian Raymond Percival. Viera also announced the Club’s intention to go back into the schools to recruit young golfers, taking the time to sing the praises of former junior golfer Trevor Levine who was a past St. Kitts Open Champion. Viera said that Levine now had the same handicap as multiple golf champion Tiger Woods. The junior golf programme is coordinated by Trevor Levine and Zeke Percival. Ewing, an avid golfer himself, said he was pleased to be sponsoring the event yet again and that he was very excited about the tournament. would be a great asset to junior golf because as Vernon said, we want to develop young local golfers. We want to make sure that it’s not a rich man’s sport but a sport that anyone can play so we want to make sure they have the equipment to play and play well,” Ewing said. White added brief remarks reiterating his company’s commitment to sponsorship of the programme as well as to the development of junior golf. “We to confirm the renewal of our sponsorship of the St. Kitts Open Golf Championship. We were involved last year and we thought it was professionally done and well organised. We’ve not only renewed our sponsorship but we have also increased it from five thousand EC dollars to Us five thousand dollars. We will also provide gift packages for the participants in the event. We feel that this is a growing event and something that will continue to evolve into something bigger. We believe that this product has the potential to grow the tourism part of St. Kitts and so we will do whatever we can to support this tournament,” White said. Over 150 golfers are expected to participate in the tournament with representation from countries reaching as far as Miami and Trinidad. They will vie for titles from five categories including the Championship, Men’s, Ladies’, Seniors and Super Seniors. The tournament will be officially opened at a reception on May 24th followed by three days of golf play and a prize giving and closing ceremony.